Delta State Governor, Senator Ifeanyi Okowa has expressed deep sympathy to the Nigeria Labour Congress, (NLC) Delta State Council, Nigeria Union of Local Government Employees, (NULGE) and the Ofoeyeno family over the death of their Chairman and father, late Comrade David Ofoeyeno. In a statement by the Governor’s Chief Press Secretary, Mr Charles Ehiedu Aniagwu, Governor Okowa said he was deeply touched by the death of Comrade David Ofoeyeno, a well known and respected labour leader in the state. Governor Okowa described Comrade Ofoeyeno as a personal friend whose invaluable support and contributions to labour movement will be missed by all and sundry. The statement further urged the Ofoeyeno family to see the death of their beloved patriarch as an act of God, and urged the children of the deceased to emulate the exemplary life of their father and be consoled by the knowledge that their late father lived a worthy and very fulfilled life in the service of his family and organized labour in Delta State. The Governor prays that God will grant organized labour, the Ofoeyeno family the fortitude to bear the loss of Comrade David Ofoeyeno and prayed God almighty to grant him eternal rest. In his own condolence message, immediate past Governor of Delta State, Dr. Emmanuel Eweta Uduaghan has described the death of the chairman of the Nigeria Labour Congress, Delta chapter, Comrade David Ofoeyeno‎, as a personal loss and big blow to the labour movement in Delta State and the country. Reacting to the news of the death, Dr. Uduaghan recalled with sadness that while he was the Governor, the NLC maintained a very cordial industrial relationship with the state government with the late Ofoeyeno holding sway as chairman of the state council, adding that the deceased Labour Leader helped to sustain industrial harmony during his tenure as governor. In a statement issued in Warri and signed by his media aide, Sunny Areh, the former governor said the ex-NLC boss was an ambassador of peace who worked assiduously for the welfare of workers and promoted industrial harmony throughout his tenure. According to him, “The late Comrade Ofoeyeno was an ambassador of peace who worked tirelessly for the welfare of workers and ensured that there was industrial harmony in the state when I was Governor. “I started working with him when he was Chairman of the Delta State chapter of the Nigeria Union of Local Government Employees and I can attest that all issues concerning workers’ welfare were very dear to him. Dr. Uduaghan however expressed regrets that Ofoeyeno bowed out at a time when his wisdom, intellect and experience in industrial relations were most needed by the labour movement and the nation at large. He prayed that God should give his immediate family, the state council of NLC and entire Labour community in the country fortitude to bear the loss. 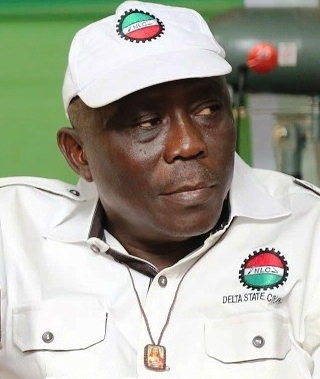 Recall that the Delta State chapter of the Nigeria Labour Congress (NLC) had elected David Ofoyeno, a member and former Chairman of the National Union of Local Government Employees (NULGE), as chairman, in April, 2015. Ofoyenu had successfully polled 762 to defeat his closest rival Goodluck Ofoburuku, a staff of the state’s Hospital Management Board (HMB) and also the then state chairman of the Joint Negotiation Council (JNC), who scored 655 from the total valid votes of 1,417, after a keenly contested election, monitored by officials sent by the national body, at the Cenotaph in Asaba, the capital of Delta State. Ofoeyeno, widely regarded and accepted as the authentic Delta NLC Chairman, had to contend hovever with a parallel faction of the NLC in the state, following the factionalization of the national NLC between the present NLC National Chairman Coomrade Ayuba Wabba and the factional Chairman Comrade Joe Ajaero, which led to the election of Williams Akporeha, the then incumbent Delta state chairman, who doubled as the state chairman of NUPENG and was loyal to the Joe Ajaero factional NLC, in Warri axis of the state. Speaking further Ofoeyeno had said: “What happened is that there is a self-acclaimed chairman, who believes that because of the incident that happened at the national level in the NLC following the outcome of the previous election, he could still be parading himself as a parallel chairman. But I think, as at today, NLC is one, both in Delta State and at the national level. “When you look at the union per se, we have about 46 industrial unions that are affiliated to NLC and as at today, only two unions, NUPENG and another one, are claiming that they are not satisfied with the last election held at the national level. “However, in Delta State, all the unions participated in the election, even my predecessor, who was the former NLC chairman in the state, inaugurated the committee that conducted the election, so it is not true that in Delta State there are two NLC factions. There is just one NLC; there is no divided NLC in Delta State,” he had concluded authoritatively. A great philatropist, well known for his legendary generosity, Ofoeyeno was a beloved and well respected labour leader, who displayed great brinkmanship, magnanimity, camaraderie and an admirable authority, which he commanded with imperious equanimity, aplomb and integrity, both as a distinguished and meritorious Delta NULGE Chairman and during his now truncated tenure as Delta NLC Chairman. He last public apppearnce was said to be at the Worker’s Day celebration in May 2016, although he had been in constant dialogue and negotiations with the Delta State Government and Governor Ifeanyi Okowa, on how to address and resolve the long standing imbroglio of several months salary arreas owed Local Government Workers, as well as settling the outstanding payments owed pensioners, in the state. He reportedly underwent a medical operation around the period he was elected as Delta NLC Chairman, amid speculations that he was diabetic and had looked gaunt, pale and a shadow of his old ebullient self, even as he bravely soldired on and like a true comrade and made a great effort to recover his dynamism and energetic spring, in his few public appearances afterwards, before he purportedly lost his battle to diabetes, when he passed away on Monday, September 19, 2016, in Warri Delta State, at the age of 55. May his gentle soul rest in peace, Amen.